The mini bus can be viewed from November 14-21 at the Automotive Center's upper level parking lot, building 648, plate# W901508. Minimum bid is $20,000 or best offer. The mini bus sold “as is,” no refunds or guarantees (approx 5,200 miles). Please submit your bid in an envelope as indicated below. 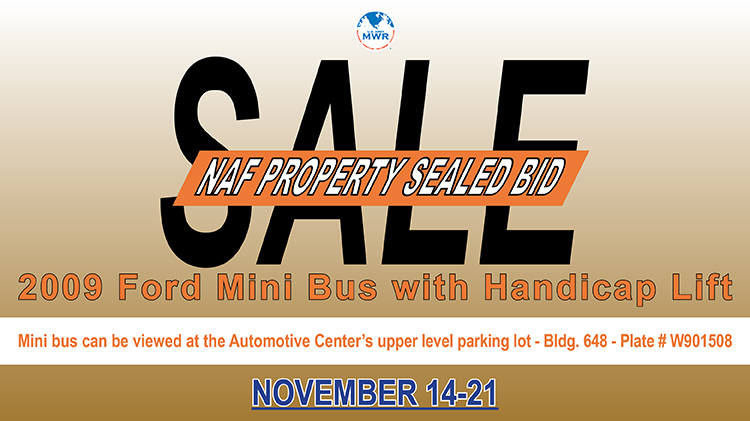 Bids must be received NLT 4:30pm, November 26, 2018. Note: Family and MWR reserves the right to reject any bids. Persons involved in the opening and recording of bids are not authorized to submit bids.